A happy, beautiful, under-sized, frequently neglected child, her mother often left her to the care of others, including a sister who was a Dominican nun. Marietta grew up and had her best times in her sister's convent, and four of her sisters eventually entered religious life. When her father arranged a marriage for Maria, she actually fainted in horror. The thought of marriage made her so sick that she eventually became unable to walk, and was bed-ridden. Her father, a man easily swayed by quacks, crack-pots and con men, put her through 34 years of flummery and what passed for medical treatment in the 16th century. Being bed-ridden, Maria was not able to follow her sisters into the convent, but she did become a Dominican tertiary in 1544. She made her formal profession in 1545, and was soon able to get out of bed for brief periods. However, a combination of pleurisy, asthma, kidney disease, and the non-stop "treatments" she received from assorted quacks and cranks immobilized her again. She began to have visions, and to converse with angels, devils and saints. Her neighbors thought she was possessed, but a local priest became her spiritual advisor, and reassured the locals that Marietta was not in league with the devil or being attacked by him. With the priest's assurances, Marietta's room became a place for area pilgrims who came to her for wisdom and peace, and for area animals, especially cats. Cats had a special affection for her, many stayed in her room, slept on her bed, guarded her pet songbirds, and at least once fetched her some cheese when she became hungry. Maria developed a deep devotion to Saint Bartholomew the Apostle, and added his name to hers. As her visions and ecstacies continued and became more constant, she became more mystical in her conversation, became focused on the glorious and sorrowful mysteries, and was seen to levitate. 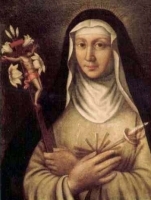 She came to know Saint Mary Magdalen of Pazzi, and shared her visions with her. The son of Ioan Hossu and Victoria Mariutiu. He studied at the Seminary of Cluj, Romania, the seminary of Budapest, Hungary, the University of Vienna, Austria, and the Pontifical Urbanian Athenaeum “De Propaganda Fide,” Rome, Italy. He earned a doctorate in philosophy in 1906, and one in theology in 1908. Ordained a priest in the archdiocese of Fagaras si Alba Iulia, Romania on 27 March 1910; the ordination was performed by his uncle, Bishop Vasile Hossu. From 1911 to 1914 he served variously as protocolist, archivist, librarian, vicar-general and secretary to the bishop of Gherla, Romania. Military chaplain to the Romanian soldiers in the Austro-Hungarian Army during World War I from 1914 to 1917. Chosen Bishop of Cluj-Gherla, Romania by Pope Benedict XV on 21 April 1917. Apostolic Administrator of Maramures, Romania from 19 July 1930 till 31 January 1931. Apostolic Administrator of Oradea Mare, Romania from 29 August 1941 till 1947. For opposing the state-ordered separation of Byzantine-Rumanian Church from Rome, he was imprisoned in prisons in the Romanian cities of Jilava, Drogoslavele, Sighet, and Gherla from 1948 till 1964, and then at the monastery of Caldrusani in Moara Saraca near Bucharest, Romania from 1964 until his health began to fail in 1970 when he was moved to hospital. Secretlu elevated to cardinal by Pope Paul VI on 28 April 1969, but to prevent additional abuse, this was was not revealed until after the Cardinals‘ death. Martyr. The fifth of eight children. Entered the Minor Seminary of Castello sopra Lecco, Italy at age 12; studied in the Major Seminaries of Monza and Milan in Italy. Ordained in the archdiocese of Milan, Italy on 28 May 1825. Taught in the seminaries of Castello sopra Lecco, Seveso and Monza. A highly educated and cultured man with deep knowledge of the early Church fathers and archeology. Spiritual director of the Major Seminary of Milan in 1833. With the help of Mother Mariana Videmari, in 1836 Father Biraghi founded the Institute of the Sisters of Saint Marcellina (Marcellina Sisters) at Cernusco sul Naviglio; the Institute requires fidelity to the faith in daily life by its members, and established schools for girls, both the nobility who could pay for it, and the poor who were not required. Named a doctor of the prestigious Biblioteca Ambrosiana in 1855. Honorary canon of the Basilica of Saint Ambrose. In 1862, by the Pope's request, he acted as mediator among the clergy of Milan who were split between those who supported a united Italy, and those who sought the return of the Papal States. Vice-Prefect of the Ambrosiana in 1864. 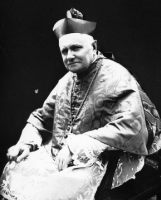 Appointed Domestic Prelate to Blessed Pope Pius IX in 1873. Today the Marcellina Sisters continue their good work in Italy, France, Brazil, Switzerland, England, Albania, Canada, and Mexico. Daughter of the Duke of Clarence. Niece of King Edward IV and King Richard III of England. Married Sir Richard Pole in 1491. Mother of five, one of whom became a cardinal. Widow. Unofficial ward of King Henry VIII, who made her Countess of Salisbury and governess to Princess Mary, daughter of Henry VIII. When she opposed Henry's plan to marry Ann Boleyn, she was driven from court and received the king's disfavor. When her son, Cardinal Reginald Pole, wrote against Henry's presumptions to spiritual supremacy, the king decided to crush the family. Two of Margaret's sons were executed in 1538 for the crime of being the brothers of Reginald. The elderly Margaret was arrested soon after, falsley charged with plotting revolution; in 1539 she was sent to the Tower of London where she spent her remaining two years. In 1541, at the outbreak of an actual uprising, Margaret was summarily executed with trial as a precaution. Martyr. After a liberal education in England, he went to Normandy and entered the monastery at Bec, where he opened a famous school. An opponent of the doctrines of Berengarius, he succeeded in having the Catholic doctrine defined at the Lateran Council of 1059. 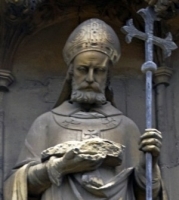 He obtained the papal dispensation for the marriage of William, Duke of Normandy, to Matilda of Flanders, and after William’s invasion of England in 1066, Lanfranc was made Archbishop of Canterbury. He secured the primacy of the See of Canterbury over that of York, helped reform the Church in Scotland, and prevented many ruptures between the king and pope over the question of tithes. In the struggle over investitures, he consistently upheld the rights of the Church. Lanfranc probably advised the king to name William Rufus his successor, and he subsequently made constant efforts to check the evil deeds of the latter. Born to a Christian family in the apostolic vicariate of West Cochinchina (in modern Vietnam), Paul and two of his brothers joined a band of highwaymen and burglars, with Paul as their leader. When Paul insisted that the thieves return some of their loot to the poor, they betrayed him to the authorities, accusing him of treason by collaborating with the French. Arrested, Paul denied the treason but proclaimed himself a sinful Christian and refused to renounce his faith. Tortured and martyred in the persecutions of emperor Tu-Duc. Born to the nobility, the son of Aldana and Count Thierry of Toulouse. Career soldier. 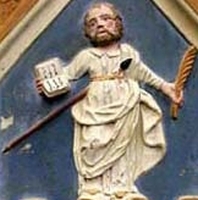 Member of the court of Blessed Charlemagne. Duke of Aquitaine. Led forces against the Saracens in southern France. In retirement he built a monastery at Gellone, France, and became a Benedictine monk there; the house was later named Saint-Guilhem-du-Desert in his honour. His reputation for chivalry, bravery and piety led to medieval romances being written about him including the Chançun de Guillaume (Song of William). 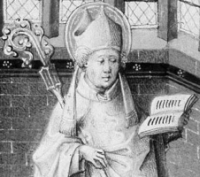 Priest, ordained by Saint Agrippinus of Autun. Abbot. Bishop of Paris, France in 555. Taught and ordained Saint Bertrand of Le Mans. Spiritual teacher of Saint Droctoveus. Cured King Childebert I from an unnamed illness, and converted him from a misspent life. The king then built him the abbey of Saint Vincent, now known as Saint-Germain-des-Pres. Studied at the seminary of Plock, Poland. Ordained on 10 July 1881 in Plock. Rector of the Plock seminary. Vicar General of Plock in 1902. Bishop of Plock on 12 June 1908. Titular Archbishop of Silyum on 25 November 1930. Known for his deep spiritual and prayer life. Imprisoned with a a group of his priests during the Nazi occupation, he was taken from prison to prison, tortured repeatedly, and eventually allowed to die of abuse. Martyr. Franciscan friar minor. Priest in the early 15th century. Noted and distiguished travelling preacher known to his his austerity, his long fasts, and as a miracle worker. While he was preaching in the cathedral of Lucca, Italy during Lent of 1430, the city came under seige by the army of Florence, Italy; Herculaneum rallied the people of Lucca, found ways to smuggle food into the city, and helped them keep their faith until the seige ended; the people of Lucca gave him the Pozzuolo convent in thanks and to insure he returned. Sent by the papal legate to preach missions in the east from 1435 to 1437. When his parents died, Caraunus sold all his goods and estate, distributed the money to the poor, and retired from the world to live as a prayerful hermit. His reputation for holiness spread, his local bishop ordained Caraunus as a deacon, and the new deacon gave up the life of a hermit to serve as a missionary to areas of Gaul where the faith had all but disappeared. Educated at Brasenose College, Oxford, England graduating in 1566. Schoolmaster in London, England. Convert to Catholicism. Servant to Dr Thomas Stapleton at Douai, France. Studied at Douai, and at Rome, Italy. Ordained in 1576 at the English College at Rome. Returned to England on 27 August 1579 to minster to covert Catholics. Arrested for the crime of being a priest, and sent to the Tower of London on 14 July 1581. Martyr. Received a Master of Arts at Trinity College, Oxford, England on 14 July 1567. Fellow of Trinity College. Left to study at the English College, Douai, France in 1570. Ordained in March 1573 at Brussels, Belgium. Returned to the apostolic vicariate of England on 2 May 1576. Chaplain to Edward Yates and the Bridgettins at Lyford, Berkshire. Arrested on 17 July 1581, he was imprisoned and tortured in the Tower of London, accused and tried for treason as part of a non-existent conspiracy of Catholics against the crown, and executed in the persecutions of Queen Elizabeth I. Martyr. An only child born to a poor but pious family, she was early drawn to religious life and the care of people even poorer than herself. Joining the Order of Saint John of Jerusalem at age 15, she lived a nun‘s life for 55 years. Had the gift of miraculously healing. Studied at Rheims, France, and Rome, Italy. Ordained at Douai, France in 1576. He then returned to England to minister to covert Catholics in the London area. Arrested in 1580 in connection with the non-existent Rheims and Rome Plot. Imprisoned in the Tower of London. Tried and convicted with Saint Edmund Campion and others. Martyr. Priest in the archdiocese of Gniezno, Poland. Imprisoned and martyred by Nazis for preaching Christianity. In her youth, Anna made a private vow, consecrating herself to God. She joined the Mercedarians at the monastery of the Assumption in Seville, Spain, taking the name Sister Mary of the Nativity. Known for her deep contemplative prayer life, she received visions of heaven, and spent her time in praise of God. People throughout the region flocked to the convent to have her pray for them. Convert, baptized by Saint Peter the Apostle. Spiritual student of Saint Paul the Apostle. Martyr. Tortured, mutilated and martyred in the persecutions of Decius for refusing to worship idols. Vincentian priest. Martyred in the Spanish Civil War. Member of the Ordo Fratrum Sancti Pauli Primi Eremita (Order of Friars of Saint Paul the First Hermit) in 15th century Hungary. Noted speaker. Wrote poetry in Latin. No reliable information has survived. Convert during the 1st century. Deacon. Missionary to Gaul. Martyred in the persecutions of Domitian. First bishop of Urgell, Spain. Wrote a commentary on the Song of Songs. First century bishop of Cagliari, Italy. Martyred in the persecutions of Nero. Priest. Bishop of Florence, Italy in 990. 7th century monk of Iona, Scotland. A group of early 5th century monks in Palestine who were martyred by invading Arabs. A group of early Christians for whom a church on Sardinia is dedicated; they were probably martyrs, but no information about them has survived except the names Aemilian, Aemilius, Emilius, Felix, Lucian and Priamus.